Collecting slim and utilitarian custom hotel notepads is a hobby for many people because it fuels their travel memories. This is the sole reason why many hoteliers are particular about offering personalized hotel notepads as the welcome and parting gift to their guests. These notepads are usually imprinted with brilliant and engaging visuals and they can trigger a poet in every common man. 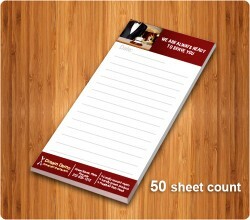 A person who receives it as a gift will always make it a point to keep such interesting promotional hotel notepads closer to them at home or office and scribble their favorite pieces of information all over them. Many people don’t know that personalized hotel pads have been around even before the wireless communication happened and its popularity has never plunged even a bit because they always have plenty to offer users and hoteliers!